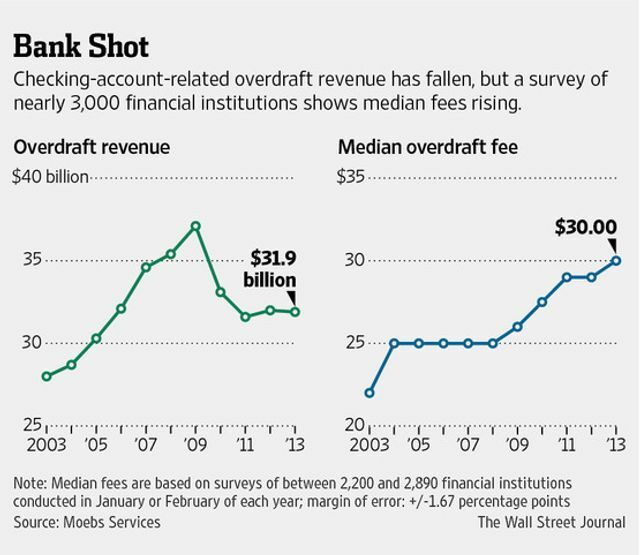 Squeezed by falling revenue on deposit accounts, banks are turning to a familiar source of income: overdraft fees. Overdraft fees make up the bulk of checking-account fee revenue, said Jefferson Harralson, a banking analyst at Keefe, Bruyette & Woods Inc. in Atlanta. Financial institutions generated $31.9 billion in overdraft revenue in 2013, compared with $32 billion in 2012, said Moebs. It had fallen to a recent low of $31.6 billion in 2011, from a peak of $37.1 billion in 2009. The fees can reach as much as $50 per transaction, according to the Moebs survey. Consumers had an average of $4,434 in checking accounts last year, up from $4,036 in 2012 and $2,010 in 2009, according to data from Moebs and the Federal Reserve.